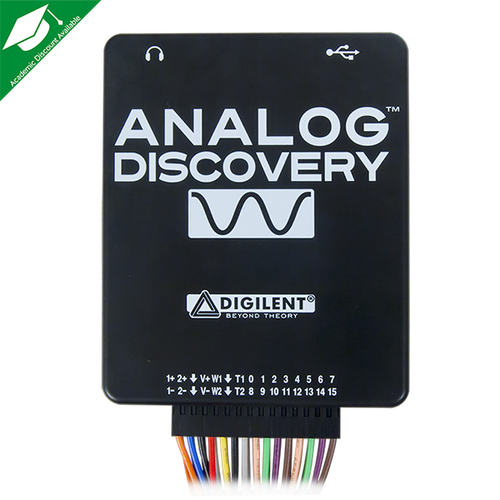 The Digilent Analog Discovery™, developed in conjunction with Analog Devices Inc., is a multi-function instrument that can measure, record and generate analog and digital signals. The small, portable and low-cost Analog Discovery (Figure 1) was created so that engineering students could work with analog and digital circuits anytime, anywhere - right from their PC. Two power supplies (+5V at 50mA, -5V at 50mA). 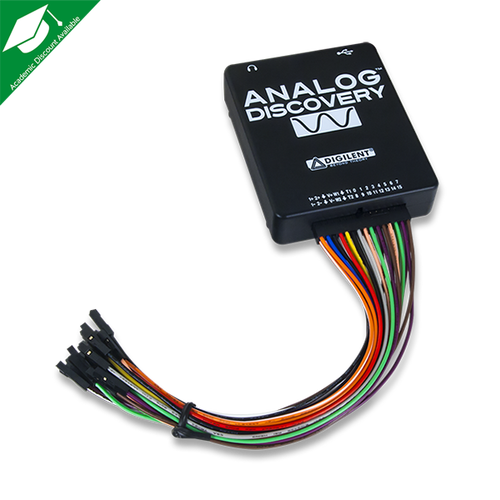 The Analog Discovery was designed for students in typical university-based circuits and electronics classes. Its features and specifications, including operating from USB power, a small and portable form factor, and the ability to be used by students in a variety of environments at low cost, are based directly on inputs from many professors at many universities. Meeting all the requirements proved challenging, and resulted in some new and innovative circuits. This document is a reference for the Analog Discovery’s electrical functions and operations. This reference also provides a description of the hardware’s features and limitations. It is not intended to provide enough information to enable complete duplication of the Analog Discovery, or to allow users to design custom configurations for programmable parts in the design. If you are using the default Fly by Wire - Breadboard Wires on the Analog Discovery, the Pin Diagram may be helpful. Analog Discovery’s high-level block diagram is presented in figure 2 below. 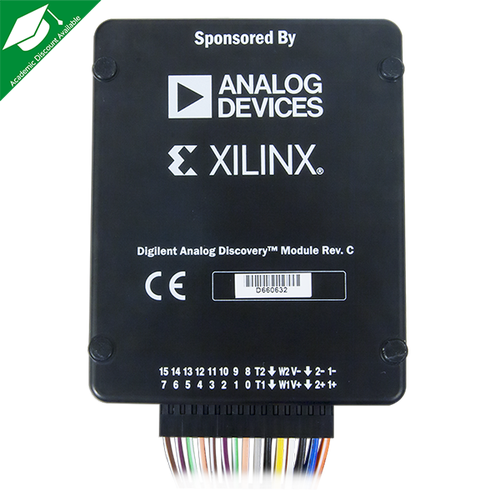 The core of the Analog Discovery is the Xilinx Spartan 6 FPGA (specifically, the XC6SLX16-1L device). The Waveforms software automatically programs Discovery’s FPGA at start-up with a configuration file designed to implement a multi-function test and measurement instrument. Once programmed, the FPGA communicates with the PC-based Waveforms software via a USB2.0 connection. The Waveforms software works with the FPGA to control all the functional blocks of the Analog Discovery, including setting parameters, acquiring data, and transferring and storing data. ADC – the Analog to Digital Converter for both scope channels. Audio – audio amplifiers for headphone. A precision Oscillator and a Clock Generator provide a high quality clock signal for the AD and DA converters. The Digital I/O block exposes protected access to the FPGA pins assigned for the Digital Pattern Generator and Logic Analyzer. The Power Supplies and Control block generates all internal supply voltages and user supply voltages. The control block also monitors the device power consumption for USB compliance (all power for the Analog Discovery is supplied via the USB connection). Under the FPGA control, power for unused functional blocks can be turned off. The USB controller interfaces with the PC for programming the volatile FPGA memory after power on or when a new configuration is requested. After that, it performs the data transfer between the PC and FPGA. The Calibration Memory stores all calibration parameters. Except for the “Probe Calibration” trimmers in the scope Input divider, the Analog Discovery includes no analog calibration circuitry. Instead, a calibration operation is performed at manufacturing (or by the user), and parameters are stored in memory. The WaveForms software uses these parameters to correct the acquired data and the generated signals. In the sections that follow, schematics are not shown separately for identical blocks. For example, the Scope Input Divider and Gain Selection schematic is only shown for channel 1 since the schematic for channel 2 is identical. Indexes are omitted where not relevant. As examples, in equation ( 4 ) below, V_(in diff) does not contain the instrument index (which by context is understood to be the Scope), nor the channel index (because the equation applies to both channels 1 and 2). In equation ( 3 ), the type index is also missing, because Vmux and Vin refer to any of P (positive), N (negative) or diff (differential) values. Figure 3 shows the scope input divider and gain selection stage. An analog switch (ADG612) allows selecting High Gain versus Low Gain (EN_HG_SC1, EN_LG_SC1) signals from the FPGA. The P and N branches of the differential path are switched together. A non-inverting OpAmp stage provides a very high impedance as load for the input divider (Figure 4). Resistors and capacitors in the figure help to maximize the bandwidth and reduce peaking (which might be significant at unity gain). The AD8066 is supplied ± 5.5V. Figure 5 shows the scope voltage reference sources and offset control stage. A low noise reference is used to generate reference voltages for all the scope stages. Buffered and scaled replicas of the reference voltages are provided for the buffer stages and individually for each scope channel to minimize crosstalk. A dual channel DAC generates the offset voltages, to be added over the input signal, for vertical position. Buffers are used to provide low impedance. Providing the common mode voltage for the ADC. Adding the offset (for vertical position on the scope). VREF_SC1 is constant at midrange of VOFF_SC1. This way, the added offset can be either positive or negative. ADC protection by clamping the output signals. Protection is important since IC2 is supplied ±3.3V, while the ADC inputs only support -0.1…2.1V. The IC2A constant output signals act as clamping voltages for the Schottky diodes D1, D2. A precision oscillator (IC31) generates a low jitter, 20MHz clock (see Figure 8). The ADF4360-9 Clock Generator PLL with Integrated VCO is configured for generating a 200MHz differential clock for the ADC and a 100MHz single ended clock for the DAC. Analog Devices ADIsimPLL software was used for designing the clock generator (see Figure 7). The PLL filter is optimized for constant frequency (low Loop Bandwidth = 50KHz and Phase Margin = 60deg.). Simulation results are shown below. The Phase jitter using a brick wall filter (10.0kHz to 100kHz) is 0.04 degrees rms. The differential inputs are driven via a Low pass filter comprised of C141 together with R10 thru R13, in the buffer stage. The differential clock is AC coupled and the line is impedance matched. The clock is internally divided by 2, for operating at a constant 100MHz sampling rate. An external reference voltage is used, buffered by IC 19. The ADC generates the common mode reference voltage (VCM_SC) to be used in the buffer stage. The digital stage of the ADC and the corresponding FPGA bank arfe supplied at 1.8V. To minimize the number of used FPGA pins; a multiplexed mode is used, to combine the two channels on a single data bus. CLKOUT_SC is provided to the FPGA for synchronizing data (see Figure 10). To cover component value tolerances and to allow software calibration, only the ranges below are specified. The above adds an equivalent offset voltage Voff eq in to Vin diff, translating the ranges in ( 21 ) and ( 22 ) by Voff eq in , up to the limits in ( 24 ). Equations ( 2 ), ( 7 ), ( 8 ), ( 12 ), and ( 19 ) show signal range boundaries for keeping ICs in the input/output voltage ranges. Combining these with the gain equations, the overall linear scope operation range is shown Figure 11 and Figure 12. Each equation is represented by a closed polygon. Each figure is shown at the full range and at a detailed range. Separate figures are shown for Low Gain and for High Gain. The right hand diagrams use Vin diff and Vin CM coordinates while left hand ones use VinP and VinN coordinates. To be visible on the scope screen and not distorted, a signal should be included in all the solid line polygons of a figure (linear range = geometrical intersection of the surfaces). Only the differential input voltage is shown on the scope screen. The common mode voltage information is removed by the differential structure of the Analog Discovery scope. A signal overpassing the linear range will be distorted on the scope screen, i.e. the graphical representation will be clamped. In the diagrams below, a signal outside the linear range will be clamped to the closest point in the linear range. The clamping point is not necessarily at the scope screen top or bottom edge, as explained below. The dashed lines represent the display area on the scope screen. There are three dashed rectangles in each diagram: the middle one corresponds to the vertical position set to 0 (VoffSc = 2V) in equation ( 11 ). The left one shows the display area when vertical position is set to maximum (VoffSc = 4V), and the right one corresponds to the minimum (negative) vertical position (VoffSc = 0V). Any intermediate vertical position is possible, moving the displayable area (virtual dashed rectangle) to any intermediate position. A signal crossing the long side of the dashed rectangle exceeds the displayable input voltage range causing the ADC to saturate (either at zero or at Full Scale). This is represented on the scope screen with dashed line warning to the user. A signal keeping within the dashed rectangle but crossing any solid line, overrides electrical limits of intermediate circuits in the signal path (see the legend of the figures). This results in distorting the signal without saturating the ADC. The software has no information about this situation and cannot warn the user with specific signal representation. It is the user’s responsibility to understand and avoid such situations. For Low Gain (Figure 11), the simple condition to stay in the linear range is to keep both positive and negative inputsVinP,VinN in the ±26V range (as shown by equation ( 2 )). Note the difference between typical parameter values considered by the figures and the safer min/max values used for the equations. Figure 13 shows an example of a signal distorted due to a too large common mode input voltage. The grey line is the reference, not distorted, signal. The differential input voltage is a 4Vpp triangle on top of a -5V DC component. The common mode input voltage is 10V. The vertical position of the scope is set to 5V and High Gain is selected. The yellow line shows an identical signal, except the common mode input voltage is 15V. Figure 14 shows a typical spectral characteristic of the scope. An Agilent 3320A 20MHz Function/Arbitrary Waveform Generator was used to generate the input signal of 500mVRMS. The signal swept from 20kHz to 20MHz. A coax cable and a Digilent Discovery BNC adapter were used to connect the input signal to the Discovery inputs. The FFT view of the scope was used with the “peak hold” option. The scope was set on 500mV/div (High Gain) for the upper figure, and on 1V/div (Low Gain) for the lower one. For both scales and both channels, the 0.5dB bandwidth is 10MHz (5MHz@0.1dB). You can see from the plots, that this circuit exceeded the requirements for 5MHz of bandwidth, and the -3dB point is more than 20MHz. However, since many students who will be using the Analog Discovery don’t understand the concept of “-3dB” is the “bandwidth” of an instrument, and that a 1V input signal with -3dB applied will measure 0.707V, it was felt from a marketing standpoint to specify the bandwidth of the analog inputs as less than -0.5dB as the “bandwidth”. This ensures that when connecting a 10MHz signal on a traditional instrument (with much higher bandwidth), and the Analog Discovery, the measurements will be very similar, and lead to less confusion. The parallel Data Bus and the SPI configuration bus are driven by the FPGA. The single ended 100MHz clock is provided by the clock generator. External Vref1V_AWG reference voltage is used. The output currents (Iout_AWGx_P and _N) are converted to voltages in the I/V stage. The Full Scale is set via the FSADJx pins (see Figure 16). The ADG787 2.5Ω CMOS Low Power Dual 2:1 MUX/DEMUX is used to connect R_set of either 8kΩ or 32kΩ from FSADJx pin to GND. Buffered versions are provided to the I/V stages and individually for each AWG channel, to minimize crosstalk. IC 15 in Figure 19 converts the DAC output currents to a bipolar voltage. Low Gain is used to generate low amplitude signals with improved accuracy. Any amplitude of the output signal is derivable by combining LowGain/HighGain setting (rough) with the digital signal amplitude (fine). Only bolded ranges are used in equations ( 38 ), ( 39 ) and ( 40 ), for providing tolerance margins. The R145 PTC thermistor provides thermal protection in case of an output shortcut. A single 3.3V supply is used. The first term in equation ( 41 ) is the audio signal. The second term is the common mode DC component, removed by AC coupling. Figure 21 shows the typical spectral characteristic of the AWG. In the first experiment (solid line), a coax cable and a Digilent Discovery BNC adapter were used to connect the AWG signal to the Scope inputs. For the second experiment (dashed line) the AWG was connected to the scope inputs via the Analog Discovery wire kit. The Analog Discovery Scope hardware was considered a reference for the experiments above because it has preferred spectral characteristics to the AWG. The Network Analyzer virtual instrument in WaveForms is used to perform synchronized signal synthesis and acquisition. It takes control of channel 1 of AWG and of both scope channels. Start/Stop frequencies are set to 10kHz/10MHz, respectively. Sinus amplitude is set to 1V. The characteristic is built in 1000 steps. The 0.5dB bandwidth is 5.5MHz with the coax cable and a 3.6MHz with the wire kit. Similar to the Scope stage, the AWG exceeds the requirement of 5MHz bandwidth by far. Capacitive trimmers for balancing the Scope Input Divider and Gain Selection. No other mechanical trimmers (as these are big, expensive, not reliable and affected by vibrations, aging and temperature drifts). User software calibration, as an option. WaveForms software allows the user performing an in-house calibration and overwrite the Calibration Data. Returning to Factory Calibration is always possible. The WaveForms Software reads the calibration parameters from the connected Analog Discovery and uses them to correct both generated and acquired signals. Figure 22 shows half of the Digital I/O pin circuitry (the other half is symmetrical). J3 is the Analog Discovery user signal connector. General purpose FPGA I/O pins are used for Analog Discovery Digital I/O. FPGA pins are set to SLOW slew rate and 4mA drive strength, with no internal pull. PTC thermistors provide thermal protection in case of shortcuts. Schottky Diodes double the internal FPGA ESD protection diodes for increasing the acceptable current in case of overvoltage. Nominal resistance of the PTCs (220Ω) and parasitical capacitance of the Schottky diodes (2.2pF) and FPGA pins (10pF) limit the bandwidth of the input pins. For output pins, the PTCs and the load impedance limit the bandwidth and power. Input and output pins are LVCMOS3V3. Inputs are 5V tolerant. Overvoltage up to ±20V is supported. This block includes all power monitoring and control circuitry, internal power supplies and user power supplies. An ADM1177 Hot Swap Controller and Digital Power Monitor with Soft Start Pin is used to provide USB power compliance (Figure 23). If the current drops below〖 I〗_limit before t_fault, normal operation begins. During normal operation, the FPGA constantly reads the current value (Optionally displayed on Main Window/Discovery). If a value of 600mA is reached and Overcurrent protection is enabled (Main Window/Device/Settings/ Overcurrent protection), WaveForms turns off IC20 (ADP197), IC26, and IC27 shown in Figure 25, disabling the analog blocks and user power supplies. The FPGA and USB circuitry remain functional, for communicating with the WaveForms software. The Analog Discovery user pins are overvoltage protected. Overvoltage (or ESD) diodes short when a user pin is overdriven by the external circuitry (Circuit Under Test), back powering the input/output block and all the circuits sharing the same internal power supply. If the back-powered energy is higher than the used energy, the bi-directional power supply recovers the difference and delivers it to the previous node in the power chain. Eventually, the back-powering energy could arrive to the USB VBUS, raising the voltage above the 5V nominal value. D5 in Figure 23 protects the PC USB port against such a situation. Soft Start is not used; C183 is a No Load. If the current drops below Ilimit before tfault, normal operation begins. The current limited by equation ( 47 ) supplies both positive and negative user power supplies. After considering the efficiency of the user supply stages, about 100mA is available for user in both supplies together. The user voltages are accurate even when the USB bus voltage drops below 5V. Each supply can be disabled by the FPGA. Analog supplies need to have very low ripple to prevent noise from coupling into analog signals. Ferrite beads are used to filter the remaining switching noise and to separate the power supplies that go to the main analog circuit blocks, to avoid crosstalk. To insure low output voltage ripple a second LC filter is added and forced PWM mode is selected. Both Sepic and Cuk converters are connected to the same switching pin of the regulator. Only the positive Sepic output is regulated, while the negative output tracks the positive one. This is an accepted behavior, since similar load currents are expected on both positive and negative rails. The output current in a Sepic is discontinuous which results in a higher output ripple. To lower this ripple an additional output filter is added to the positive rail. For more information see application note: AN-1106: An Improved Topology for Creating Split Rails from a Single Input Voltage. The main requirement for the 3.3V digital supply is the reverse current capability. When a user pin is overdriven the protection diode opens and back powers circuitry connected to this supply. If the back powered energy is higher than the used energy the regulator delivers it to its input, preventing the 3.3V from rising. The 1.8V digital power supply (Figure 32) is implemented with ADP2138-1.8 Fixed Output Voltage, 800mA, 3MHz, Step-Down DC-to-DC converter. This ensures a very small solution size due to the 3MHz switching frequency and the 1mm × 1.5 mm WLCSP package. Programming the FPGA: There is no non-volatile FPGA configuration memory on the Analog Discovery. The WaveForms software identifies the connected device and downloads an appropriate .bit file at power-up, via a Digilent USB-JTAG interface. Adept run-time is used for low level protocols. Data exchange: All instrument configuration data, acquired data and status information is handled via a Digilent synchronous parallel bus and USB interface. Speed up to 20MB/sec. is reached, depending on USB port type and load as well as PC performance. Block and Distributed RAM of the FPGA are used for signal synthesis and acquisition. Multiple configuration files are available through WaveForms software, to allocate the RAM resources according the application. A detail of trigger system is shown in Figure 34. Each instrument generates a trigger signal when a trigger condition is met. Each trigger signal (including external triggers) can trigger any instrument and drive the external trigger outputs. This way, all the instruments can synchronize to each other. This chapter shows the features and performances as described in the Analog Discovery Data sheet. Footnotes add detailed information and annotate the HW description in this Manual. 5MHz analog bandwidth³¹ and up to 16k samples/channel³². Easily defined sweeps, envelopes, AM and FM modulation³³. Two external trigger pins can link triggers across multiple devices¹². ²High Gain or Low Gain is used in the analog signal input path for rough scaling. “Digital Zooming” is used for multiple scope scales. ³The Scope bandwidth depends on probes. 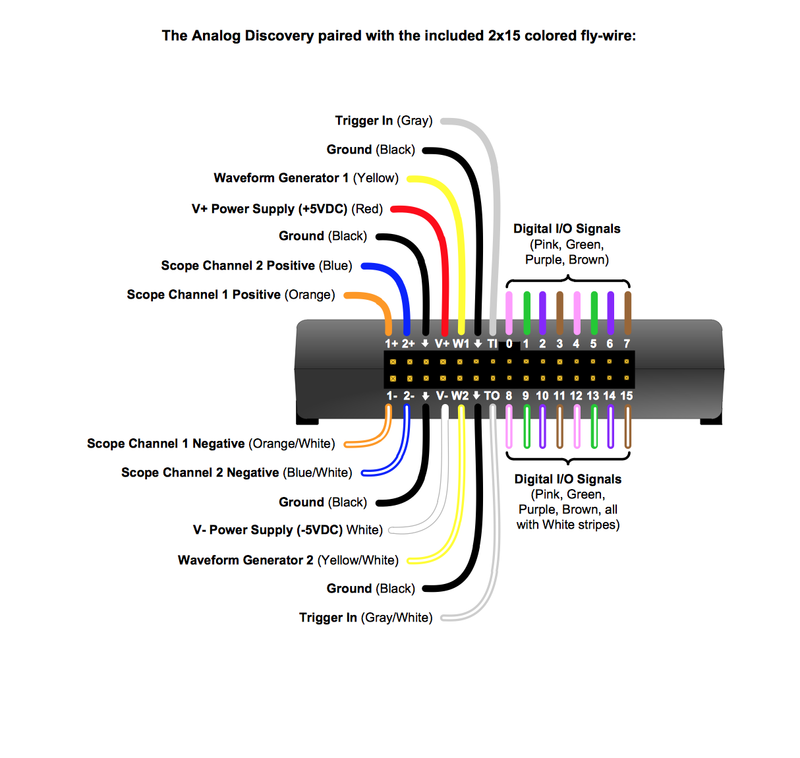 The Analog Discovery wire kit is an affordable, easy-to-use solution, but it limits the frequency, noise, and crosstalk performances. With a coax cable and Analog Discovery BNC adapter, the 0.5dB Scope bandwidth is 10MHz (see Figure 14). *As shown in Figure 11, a ±50V differential input signal does not fit in a single scope screen (ADC range). However, Vertical Position setting allows visualization of either +50V or -50V levels. ¹¹Default Scope buffer size is 8kSamples/channel. The WaveForms Device Manager (WaveForms Main Window/Device/Manager) provides alternate FPGA configuration files, with different resource allocation. With no memory allocated to the Digital I/O and reduced memory assigned to the AWG, the scope buffer size can be chosen to be 16kSamples/channel. ¹²Trigger Detectors and Trigger Distribution Networks are implemented in the FPGA. This allows real time triggering and cross-triggering of different instruments within the Analog Discovery device. Using external Trigger inputs/outputs, cross-triggering between multiple Analog Discovery devices is possible. ¹³Real time sampling modes are implemented in the FPGA. The ADC always works at 100MS/s. When a lower sampling rate is required, (108/N samples/sec), N ADC samples are used to build a single recorded sample, either by averaging or decimating. In the Min/Max mode, every 2N samples are used to calculate and store a pair of Min/Max values. The stored sample rate is reduced by half in Min/Max mode. ¹*In mixed signal mode, the scope and Digital I/O acquisition blocks use the same reference clock, for synchronization. ²¹This functionality is implemented by WaveForms software in the PC, using the buffered data from the FPGA. After acquiring a complete data buffer at the FPGA level and uploading it to the PC, the data is processed and displayed, while a new acquisition is started. ²²This functionality is implemented by WaveForms software, in the PC. ²³The AWG DAC always works at 100MS/s. When a lower sampling rate is required, (108/N samples/sec), each sample is sent N times to the DAC. ²*The AWG output voltage is limited to ±5V. This refers to the sum of AC signal and DC offset. ³¹The AWG bandwidth depends on probes. 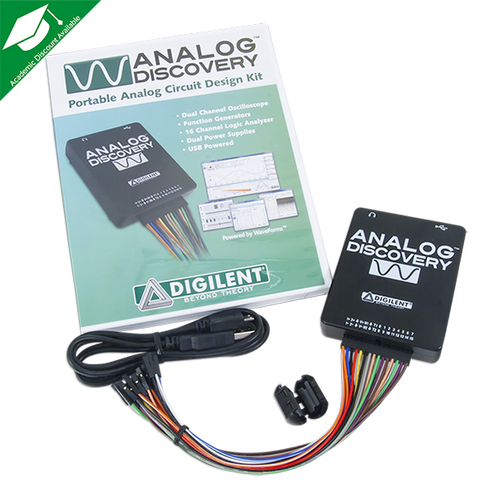 Analog Discovery wire kit is an affordable, easy-to-use solution, but it limits the frequency, noise, and crosstalk performances. With a coax cable and Analog Discovery BNC adapter, the 0.5dB AWG bandwidth is 5.5MHz (3.6MHz with the wire kit) (see Figure 21). ³²Default AWG buffer size is 4kSamples/channel. The WaveForms Device Manager (WaveForms Main Window/Device/Manager) provides alternate FPGA configuration files, with different resources allocation. With no memory allocated to the Digital I/O and reduced memory assigned to the Scope, the AWG buffer size can be chosen to be 16kSamples/channel. ³³Real time implemented in the FPGA configuration. ³*All digital I/O pins are always available as inputs, to be acquired and displayed in the Logic Analyzer and Static I/O WaveForms instruments. The user selects which pins are also used as outputs, by the Pattern Generator or Static I/O instruments. When a signal is driven by both Pattern Generator and Static I/O instruments, the Static I/O instrument has priority, except if Static I/O attempts to drive a HiZ value. *¹Default Logic Analyzer buffer size is 4kSamples/channel. The WaveForms Device Manager (WaveForms Main Window/Device/Manager) provides alternate FPGA configuration files, with different resource allocation. With no memory allocated to the Scope and AWG, the Logic Analyzer buffer size can be chosen to be 16kSamples/channel. *² Default Pattern Generator buffer size is 1kSamples/channel. The WaveForms Device Manager (WaveForms Main Window/Device/Manager) provides alternate FPGA configuration files, with different resources allocation. With no memory allocated to the Scope and AWG, the Pattern Generator buffer size can be chosen to be 16kSamples/channel. °The Voltmeter instrument in WaveForms uses Analog Inputs (Scope) Hardware resources competing with other WaveForms instruments (Scope, Network Analyzer, Spectrum Analyzer). When it starts running, the competing instruments are forced to a BUSY state. When running a competing instrument, the Voltmeter is forced in BUSY state. °°The Spectrum Analyzer instrument in WaveForms uses Analog Inputs (Scope) Hardware resources competing with other WaveForms instruments (Scope, Network Analyzer, Voltmeter). When it starts running, the competing instruments are forced to a BUSY state. When running a competing instrument, the Spectrum Analyzer is forced to a BUSY state.